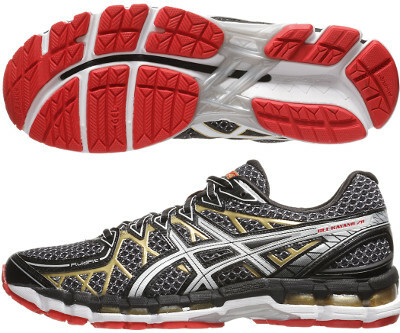 Asics Gel Kayano 20 are stability cushioned running shoes. The Asics Gel Kayano 20 pursue the outstanding success from the absolutely leader among cushioned running shoes with pronation control. Not many changes to celebrate its 20th birthday but Kayano's fans definitely will identify not only the unique blend of stability, generous cushioning and premium comfort but also the impressive price tag. Major change from its predecessor the Gel Kayano 19 it's a sewless, more modern upper based on FluidFit® (welded thin strips) for snugger fit and improved breathability. Another topic which has been dramatically improved is the broad range of colour availability to meet latest trends, stay stylish!. Another interesting feature in the Gel Kayano 20 is the first edition of the FluidRide layer in the midsole. Full-length and between footbed and rest of midsole stuff, FluidRide provides some firmness through better rebound capacity featuring an enhanced response. Well known Gel® pads can be found in both heel and forefoot for improved shock absorption combined with double density foam (soft one integrated with Dynamic Duomax) for pronation control. Plastic shank features extra stability and divides outsole in two areas: rearfoot with durable AHAR+ and forefoot with blown rubber for more grip and comfort.